Tamaño de esta previsualización: 800 × 430 píxeles. Otras resoluciones: 320 × 172 píxeles · 640 × 344 píxeles · 960 × 516 píxeles. English: Map of en:Bering Sea, showing the latitude and longitude zones of the en:Universal Transverse Mercator coordinate system, from 56U to 10W. 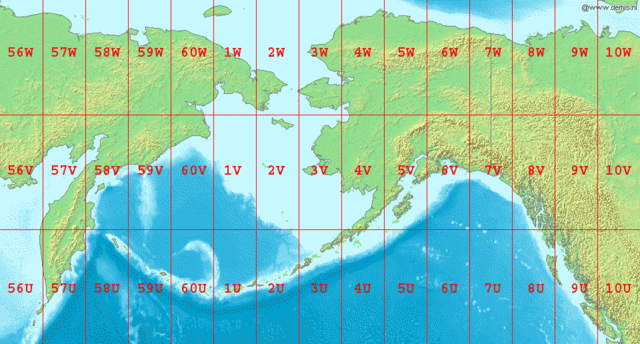 National borders between Alaska, Canada, and the continental United States are also shown. Bounding box West 150°, South 48°, East -120°, North 72°. Center at 60°00′00″N 165°00′00″W﻿ / ﻿60.00000°N 165.00000°W﻿ / 60.00000; -165.00000.